Hardy Mums - Is There Such a Thing? Edging the Beds: A Review and Giveaway! 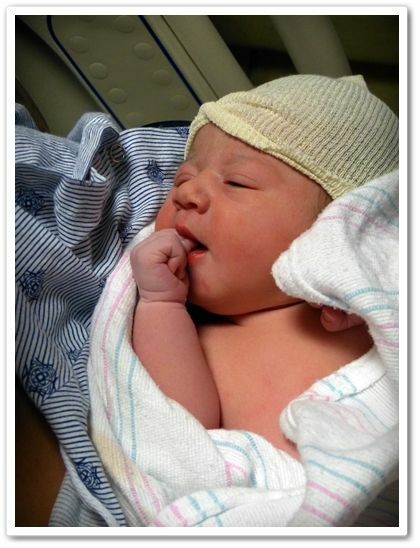 It's been nine long months, and none so long as the last one, but Little Miss Hannah Elizabeth has finally arrived! 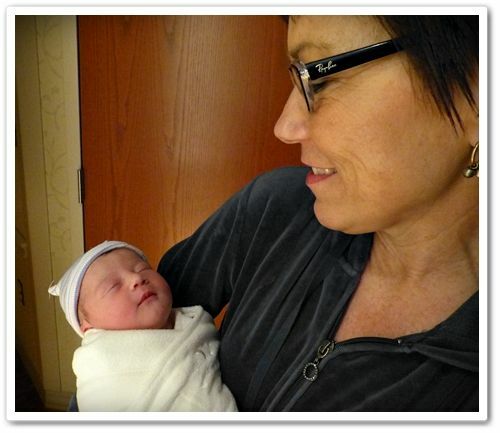 I wrote about her impending birth a few months back; she's the firstborn of our younger daughter, Jenna, and is our first grandchild. My husband, our other daughter Kara, and I were with Jenna and Joe throughout the entire day Wednesday, except for the actual birth, and it was both nerve-wracking and ecstatically joyful at the same time. Mother and baby are doing fine, and I've been staying with them to help out for a few days, ever since they got home on late Friday afternoon. Hannah's middle name is for my grandma, whose middle name is also Elizabeth. Grandma will be 98 the day after Christmas and yes, that means we have five generations. We want to get a photo of all five sometime this week. Hannah, at three days old, snuggling with me. I've been called many things in my life. Mostly Kylee. But never Becky, Kathleen, Carolyn, Donna, Ulla, Sam, Ellie, Debbie, Cherrie, Anne, Cathy, Midge, and certainly not Ron. Now THERE's a cool name. Fiona. I kind of like that. Maybe I'll change my name to Fiona. But I am NOT sleeping with Grandpa John. Niki must have good genes. Yeah, there's probably someone in our ancestry named Ann. You're very perceptive! There's two?? They must have forgotten to bring one home. Oops. I have a son??? What's his name? I seem to have forgotten. Tim! Is that his name? Our family tree is getting bigger by the hour. Shhhhh... No one was supposed to see that. But don't worry. I won't have to do that now. Last I checked, I was a GRANDMA, but I'll look again. And wow, Ted, I'll bet Christmas gets expensive for you, doesn't it? I think we should get to know you better before we let her go on play dates. I hope you get to see Trudy soon. Well, maybe that's because she's American. But there's German and Belgian in her. That's close, right? Wow. 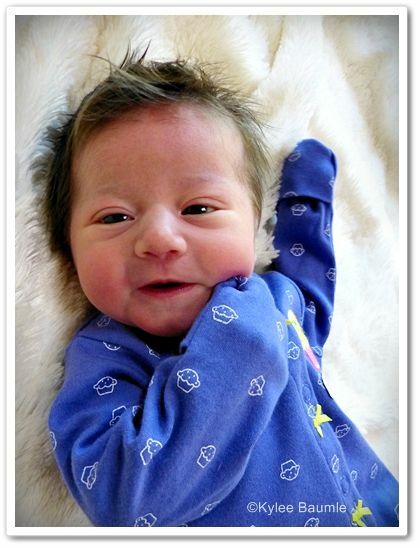 Just 48 hours later, Hannah's "sleepy" picture has officially gone viral. Her daddy, who doesn't "do" Facebook, just shook his head when we shared what's going on there and said, "So do I need to get Hannah an agent?" LOL. 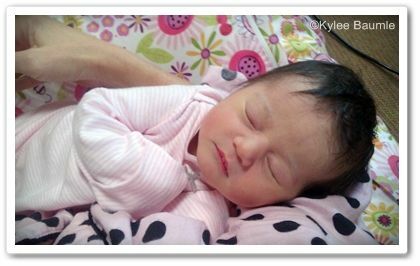 Apparently, when you post a photo of a beautiful baby (and that's something that everyone who comments seems to agree on), it's like the internets get sprinkled with magical fairy dust. We're calling it "The Hannah Effect." It's hair, people, not fur. You and 2,486 other people. Nope, and she wasn't made there either. This paragraph in my last post regarding mums has raised some discussion among plantsmen and bloggers and home gardeners and I appreciate those that have shared their views. This interaction that social media and the internet fosters is what I love most about it. We're talking garden mums here - the ones that are hardy to my Zone 5b - not the florist mums, which aren't. So if you want your mums year after year, make sure you're buying garden mums. Ask the garden center if you aren't sure. In reality, that's putting it a little too simply and may be misleading to some. That's the last thing I want to do - mislead ANYONE. So let's have a little more discussion on this issue. It's not so cut and dried, as is the case with many things in the garden, because there are so many variables. 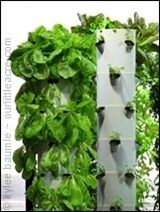 There's the soil, the location, how it's planted, pruned and protected, and of course, there are those climatic issues of temperature, wind, snow cover, and even altitude that determine whether any plant will survive winter, whether you're in Zone 3 or Zone 7. Before we get into all that though, let's talk about the types of mums that are available. 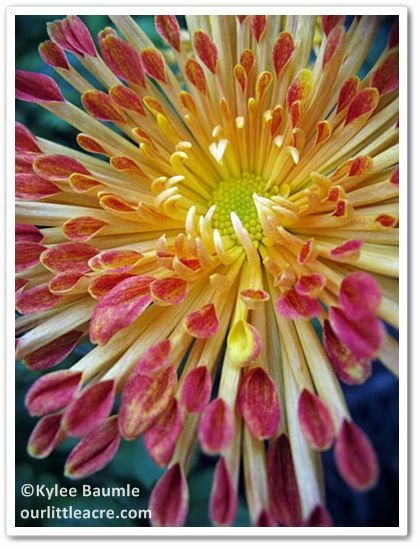 Garden mums - Generally hardy to Zones 5-9, spread by underground stolons. 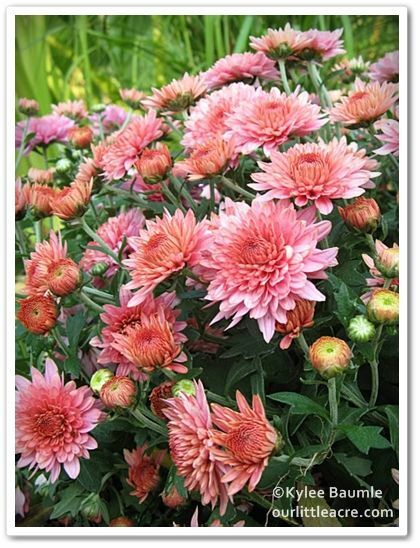 Includes the "daisy" mum like 'Clara Curtis' and 'Sheffield Pink', and those labeled Chrysanthemum x. rubellum. May also be known as Korean mum. Chrysanthemum x. morifolium is also considered to be hardy in these zones, but is not as reliable in the colder end of that spectrum. Florist mums - These do not have the same type of root system as garden mums. They do not reproduce via stolons and will not survive a frost. They do come in interesting petal patterns though, such as yellow and red striped. The thing is, with ANY mum you plant that's supposed to be hardy, they stand the best chance of surviving winter if they're planted in the spring. 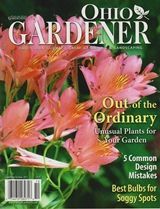 That's not likely to be the time that you're thinking about mums, given that they bloom in the fall, but if you want great blooms and longevity, spring planting is the way to go. That gives them time to become established, which will make them better able to withstand stresses during their first winter. 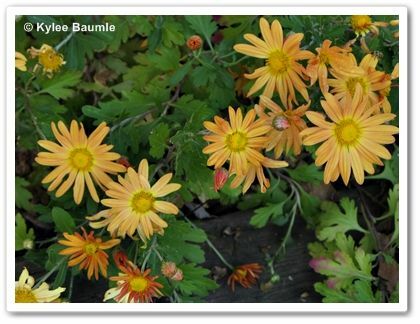 Once your mums are done blooming in the fall, you can deadhead the blooms if you want (I don't), but only the blooms. If you leave the browning foliage on all winter, that will help not only to protect the roots, but it will provide a catch-all for snow. As you know, snow cover helps protect plants in the winter, too. A few inches of mulch around the base will further help insulate the plant's roots in two ways - it will keep them warmer and it helps protect against excessive freezing and thawing cycles which can cause heaving, leaving roots exposed to cold winter temperatures and frigid air. Perennial roots of any kind don't like that very well. 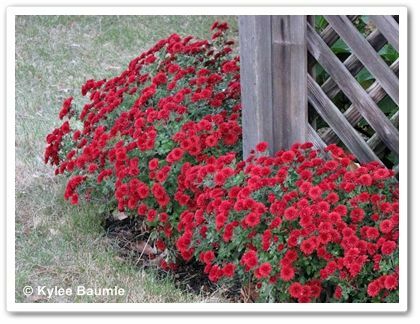 In any case, mums are fairly inexpensive, so if you buy mums for fall decorating purposes, then plant them in the ground and they fail to make it through the winter, you really won't be out much. But following these tips will give you a better chance at success. 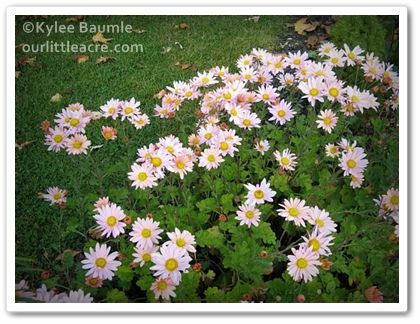 My own experience here in NW Ohio Zone 5b is that once I was careful during planting to make sure I amended our heavy clay soil to give them better drainage and didn't plant them in a low spot, I've not lost any, whether they be daisy mums or garden mums. I don't even bother buying florist mums, because I really want all of them to stick around for more than a season, if possible. Do you have any thoughts to add or experiences to share? 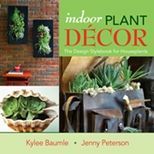 Just in Time for Fall - It's Another Lowe's GIVEAWAY! I've thoroughly enjoyed my summer stint as a part of the Lowe's Creative Ideas Garden Team. 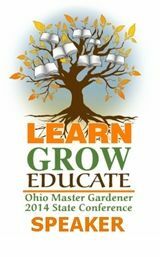 They got me thinking hard and being more creative with my gardening and other things. We've got one more project before the season wraps up, and it involves mums. 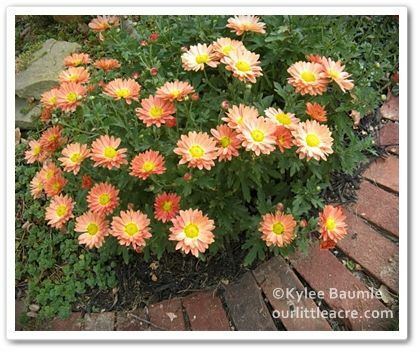 Really, if you think about fall flowers, mums really are up there at the top of the list, especially if you live where I do, in the Midwest, where fall means that summer's over and it's just a matter of time before winter comes knockin' with it's snow and ice. Asters are fabulous too, but mums have many more colors and forms to choose from. 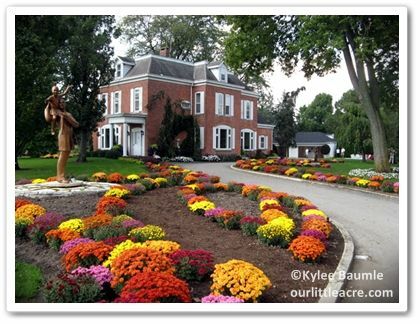 I'm still pondering how I'll use mums to perk up our autumn landscaping, but I think I know what I'll do. My idea is practical and simple, but will really do a lot to change things from a summer to fall look. 1. 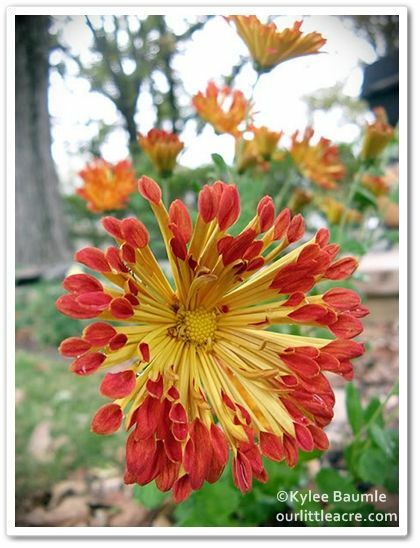 Leave a comment here on this blog post, telling me what your favorite fall flower is. No, you're not required to say, "MUMS!" but if that IS your favorite, tell me! 2. Fill out the Rafflecopter form below with your contact information. That's it. Just do those two things and you're entered. 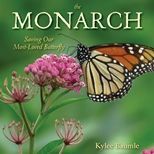 The giveaway will end next Sunday night, September 30, 2012, at midnight, EDT. A little later this week, I'll post photos of what I did with some mums here at Our Little Acre. In the meantime, check out the mums and other great fall flowers at Schedel Arboretum and Gardens in Elmore, Ohio, from an early October visit I made back in 2007. 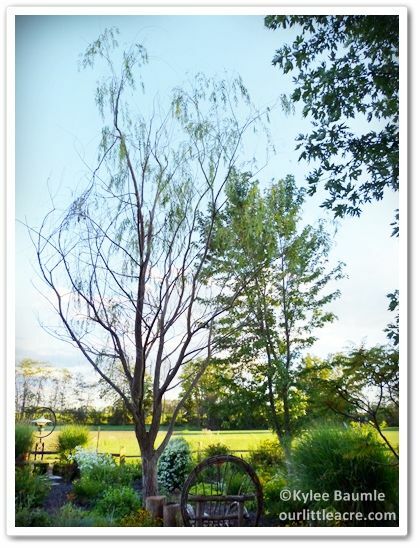 As I was walking through the garden this past weekend, I stopped to look at the ailing weeping willow tree in the middle of Max's Garden. 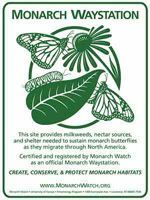 We didn't know whether or not it would survive last winter, after it was struck with bacterial wetwood disease last spring. It's still here, but it's not healthy and it really is just a matter of time before we need to bite the bullet and take it out. 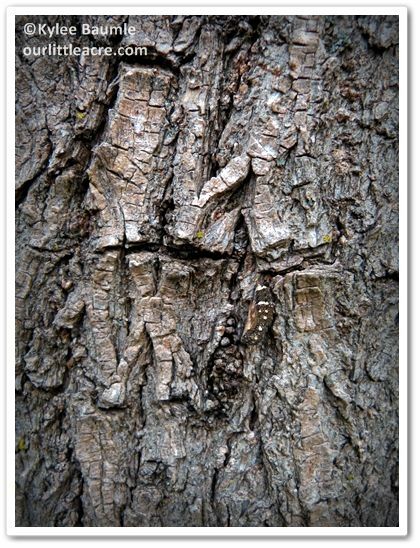 I was explaining all of this to one of our weekend house guests, and as I was showing him where I'd scraped away part of the bark (and then some) and treated it with bleach, something caught my eye. Being near-sighted comes in handy sometimes. 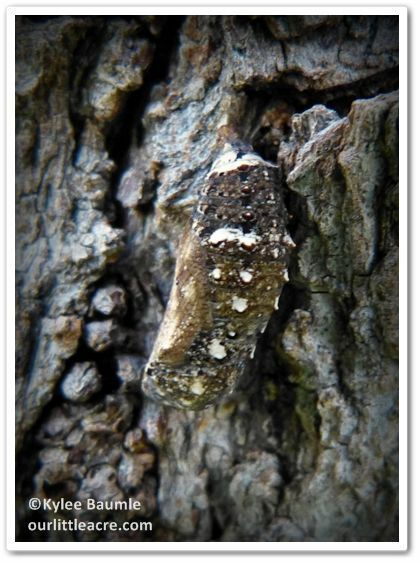 There, perfectly camouflaged, was a butterfly chrysalis. It wasn't large, maybe an inch or so in length, and it looked familiar, but I couldn't identify it for sure. I took a couple of photographs of it this evening and from what I can guess, it's the chrysalis of a Red Admiral butterfly (Vanessa atalanta). I've seen several of them flying around the garden in the last couple of weeks, after a noticeable absence since spring, when they're one of the first butterflies of the season that we see. 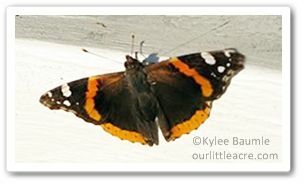 The Red Admiral migrates in spring and fall, usually spending winters in Texas and Florida, although they have been known to hibernate further north. They typically have two broods, March through October. I'm going to watch this and see what happens. Once the chrysalis is formed, it's usually two to three weeks before the adult butterfly ecloses (emerges). Like the monarch, the wings of the adult butterfly can be seen through the chrysalis a few days before eclosure.